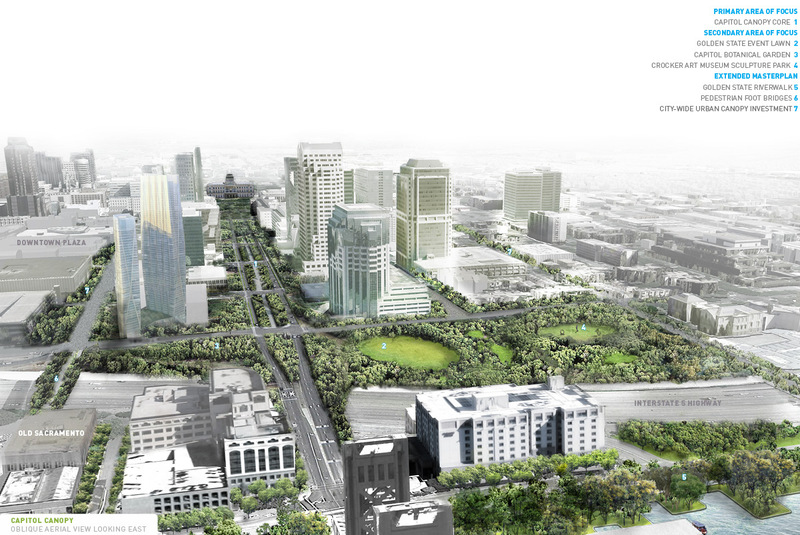 Capitol Canopy is an award winning master plan for Sacramento’s Capitol Mall. The proposal seeks to use Capitol Mall as a platform and catalyst for re-establishing and nurturing Sacramento’s tree canopy. 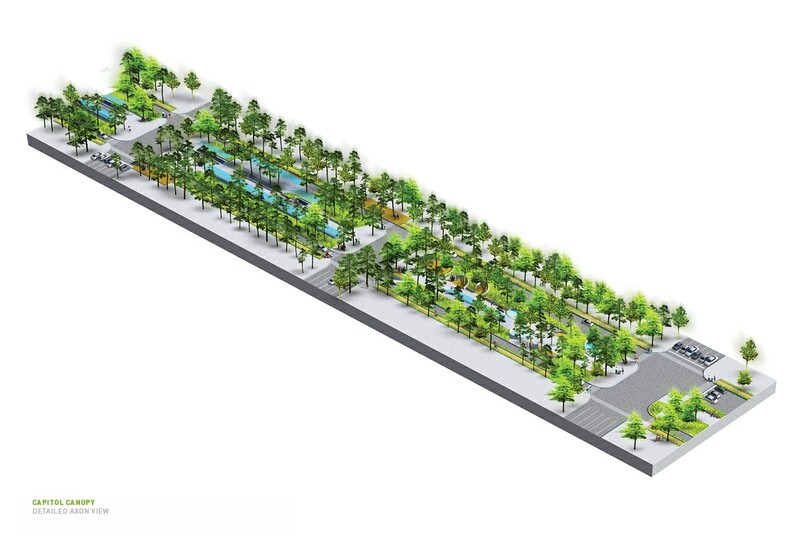 Through a re-articulated streetscape configuration, a region-specific tree canopy is deployed along the Mall and the existing median hosts a spectrum of activities that support cultural events. The urban forest is an important part of every thriving city. Tree canopies provide critical services for cities, including reducing heat island effect though the provision of shade and the creation of microclimates. With a large enough canopy, a robust tree population will reduce air pollution through bioaccumulation and the production of oxygen from carbon dioxide gas. However, the urban forest should be manifested in a different manner than the wild organization of a rural forest. While establishing a productive habitat for thousands of bird and insect species, the urban forest must be integrated with the daily functions of urban life. In terms of organization, the planting strategy should conform to the urban grid, provide year-round shade to south facing facades and allow for a varied, vibrant and continuous public realm. Sacramento is the City of Trees. The existing tree canopy returns $50 million dollars in environmental benefits each year. Yet, Sacramento’s tree canopy is aging, with no framework or proposed funding to re-establish the canopy. In response, Capitol Canopy proposes a region-specific tree canopy that consists of three distinct plant communities that foster urban habitats, while returning numerous environmental benefits to the City. The canopy is deployed through a series of phrases, spanning a 25+ year period throughout the City, first beginning with the revitalization of the Capitol Mall grounds in the heart of Downtown Sacramento. The Capitol Mall, consisting of a lawn median, is transformed into highly programmed corridor to ensure use of the Mall around the clock. 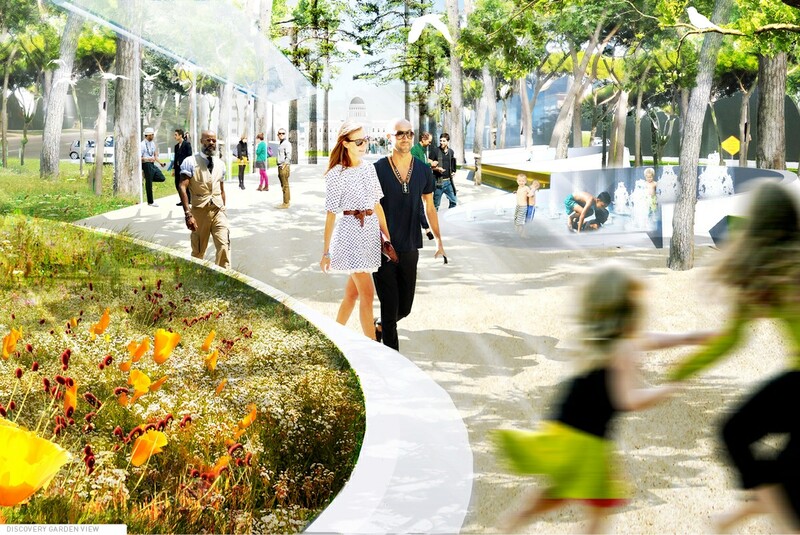 Through curb realignments and drive lane reductions, the Mall is activated through Garden and Play Pods, outdoor Farmer’s Market Canopy and Amphitheater Park, all framed by a robust urban canopy that support a multitude of City events.